Here in the US, we are nearing election day. Many of my friends in the Maine Pagan community are working tirelessly in various campaigns they believe in – some are supporting the “Gay Marriage” initiative on the ballot, others are supporting candidates they believe have the best chance to give them the future they envision, and a few are even running for office themselves. But this is not the “pagan politics” I wish to address in this article. Rather, I wish to begin with an image. It comes from an extraordinary gathering, a recent event called The Weaving, which was to be a visioning for the Maine Pagan community, in how we come together as a tribe. This photo shows the fire from the event, and will serve as a metaphor for this discussion. By the time this photo had been taken, it had been burning for hours and hadn’t required anyone to tend it. This style of self-feeding fire is called an upside-down fire (I’ve also heard it called a pyramid fire and a council fire). Once it is built with the proper structure and the tinder is ignited, the fire will burn unattended for several hours. In an upside-down fire, the largest logs are at the bottom, with the next largest logs laid perpendicular on top of the bottom layer, and so on, all the way to the top which contains twigs of kindling and then the tinder bundle at the very top. The key to an upside-down fire is structure; the logs must come together in the right way, leaning on one another. When this structure is accomplished, and with a good tinder bundle to get the fire going, the fire becomes self-sustaining and will burn for a long time – several hours – without requiring maintenance. I beg your indulgence at this clumsy extended metaphor – but I see the pagan community in the same light. If we come together with the right structure where we lean on one another, the smallest spark of inspiration will ignite the community and allow it to provide warmth and light with very little additional labor. How a society is structured – even a disparate, “herding cats” society such as the Maine pagans – is the most fundamental question of politics. But I shall take this a step further and say that “paganism” is inherently political; indeed the very name “pagan” was created, and came into widespread use, as a result of politics. For more than a thousand years, use of the term grew, laying the groundwork for systemic oppression for the pagans, the witches, and the savages. We became Other, and suspicion and fear of pagans was rewarded in the dominant monoculture. The Witch hunts. Wholesale slaughter of entire populations, mostly women, put to horrible deaths and suffering. Why? What was behind the witch hunts? Why was it so important for the Establishment power structures to cultivate a deep, cultural, and popular fear of the witch—much like the “terrorist” of today? At the same time that the prevailing worldview was turning to those core values we hold so dear today—the scientific revolution, the Enlightenment, the Reformation, and the rise of capitalism—there were also some of the most brutal examples of oppression and genocide ever witnessed, a fact that remains the paradox of our age. Together, these shifts in thinking, along with the accompanying violence and oppression justified by the new thinking, banished the pagans from their sacred lands, and forced them into urban domesticity and wageslavery. Since the witch hunts, to be pagan is, by definition, to be political, in the sense that we have resisted – and must continue to resist – the centuries-old history of genocide, oppression, torture, displacement, enclosure, slavery, and coercion that has been imposed by force. The smell of smoke lingers even today from this extraordinary turning point in our history. It was not the theology or the “faith” of the pagans that were targeted in these systematic repressions. Indeed, evidence of pagan traditions and beliefs are too numerously extant for this to be the case, from Easter-egg hunts to Christmas trees to Yule logs to maypole dancing to Halloween to Groundhog’s Day. No, the target of these attacks were the very structure of society, the pagan values and ethos that people had lived under for centuries. Most of the countless “witches” burned at the stake4 were single women, who owned land and practiced the old ways of healing, spiritual mentorship, public counsel, in competition with the clergy of the church and the aristocracy. After their burning, with the acrid smoke fresh in the air, their lands and property were seized, and over time their practices were wiped out as allopathic medicine and capitalist modes of production became dominant. In 2012, we pagans are more than ever a conquered people. Our “paganism” has been reduced to a pale reflection of the old ways in the form of rituals, most of which were re-imagined in the 20th century, with a handful of competing claims of unbroken lineages of pagan groups or families. For many of us, once the romantic appeal of these forgotten rites wore off, we began to see that they have a certain air of antiquatedness to them. It’s not that the rites are not historically valid (I will leave it to others to continue this debate), but today we live in a very different context than did our ancestors, the pagans of old. Nearly all modern pagans are domesticated urbanites, who would struggle to survive without the conveniences of civilization. The old ways are, for us, an abstraction, something we must apply our skills of imagination and visualization to bear on if we wish to engage them. Yet when we manage to listen to our inner voices and relate authentically with our ecosystem, we hear the same consistent, steady whisper: get closer to nature. Something is wrong. You have forgotten something very important. Not only do the power structures of civilization dominate all facets of our being, but they are destroying the planet to sustain themselves. The fact that relationship-with-Nature is fundamental to our metaphysics, ethics, and theologies demands that we “dirty our hands” with politics, even if we ignore our history and reject the understanding that we as pagans are a conquered people. We pagans have known for centuries that the dominant paradigm is not sustainable, is irreverent and careless with the gifts of nature, seeing her as something to exploit rather than to be in relationship-with. Political dialogue and practice in America is broken, at least to the extent that it all-too-quickly decays into partisan bickering and name-calling. While politicians on the Left and the Right blame one another, the system marches on, and 200 more species on the planet go extinct each day.5 Paganism offers a bottom-up politic that will, if we lead the way, offer a path forward to restore the pagan values that have been lost and suppressed for 500 years, stop the assault on our planet so that our ecosystems can begin to heal, and have a prayer of restoring balance to the world. 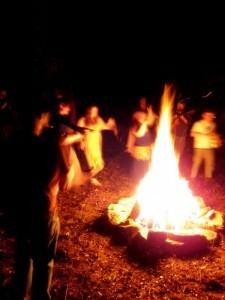 Whatever forms pagan ways-of-being will take in 2012 and beyond, they must begin and end with relationship. The existing top-down political system does not serve us, and will not be there for us as things continue to deteriorate. We pagans will need each other, and this need will only be foregrounded as more and more people are left with fewer answers and less support from the infrastructures of civilization. We pagans are suited toward bottom-up community building, and this sort of Pagan politics, where people lean on one another to sustain themselves like a long-burning fire, can be a beacon of hope to the wider world. 1 I am acutely aware of the complex relationship between modern pagans – especially white pagans who are part of the dominant culture – and indigenous people. In many ways, I don’t differentiate much between the two groups, because despite the history of brutal oppression the indigenous people have suffered, I believe our goals now are complementary at the very least. My broad conception of paganism – those who seek honorable relationship with nature – welcomes anyone for whom this is the case, no matter their racial heritage, personal history, etc. I will leave deeper analysis to others; it is beyond the scope of this article. 2 Silvia Federici, Caliban & The Witch, (New York: Autonomedia, 2004) p. 168. 4 Burning at the stake was both an unimaginably horrible way to die as well as a public spectacle, designed to incite fear about what happened to people who practiced the old ways. 5 This theme of mass extinction is explored in detail in Aric McBay, Lierre Keith, & Derrick Jensen, Deep Green Resistance (New York: Seven Stories Press, 2011).